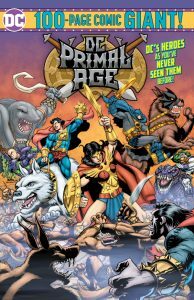 If you are an American comic buyer looking for something truly unique, check out DC’s new title: DC Primal Age. It’s a 100 page one-shot Giant, available ONLY at US Target retail stores! This Target Exclusive Giant consists of 100 pages of all-new material by some big names: Marv Wolfman, Jerry Ordway, Louise, and Walt Simonson, Brent Anderson, and more. The concept behind this Giant is this: it’s a medieval European reimagining of several DC characters. The title is based on DC Primal Age Funko toy figures, which launched in October. Go figure! So, we have Batman, Superman, Wonder Woman, Flash, Green Lantern and Aquaman, and they are in the distant past. The Primal Age. It’s the time of sword and sorcery. Their costumes are kinda low tech, as of course Polypropylene and Lycra Under Armour clothes were not available in medieval times. So we substitute stitched garments and fur! But their hero powers are intact, making this a fun concept for the creative teams to play with. The issue is made up of one long story and several story snippets. ‘The Primal Age”. written by Marv Wolfman, runs 32 pages. It’s illustrated by Scott Koblish and coloured by Tony Avina. Wonder Woman is retrieving magic orbs to help save her Amazon island but runs into Batman, who is hard to convince to let her do this. Then, enter Primal Age Joker! Then enter our heroes! It’s a good story, with lots of drama and imaginative situations. There is plenty of tension between Batman and Superman in these times, making their alliance a tenuous one. 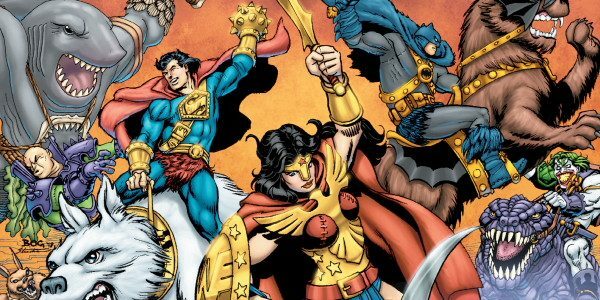 In addition to the long story, there are story segments featuring Wonder Woman, Freeze (a ‘mage’), Batman, The Joker, and Superman. Most of these short slices of life actually read like chapters of a longer story. This can be either tantalizing or tormenting to the reader; we want more. Of these ‘stories’, I was most impressed by the Batman tale, written by Louise Simonson and illustrated by Brent Anderson, with colours by Wendy Broome. The art and storytelling in this one are simply stellar. Anderson’s figures and panel progressions bring to mind Neal Adams at his peak. There are wonderful images, great gestures and a natural flow of visuals for the story. All in all, this is a fun, imaginative adventure, tying in toy figures in a sword and sorcery world of the past. Check it out at Target stores, USA only.